....well, to really no one in particular. I just am trying to build up my stash of birthday cards. I am low on every imaginable type of card lately...except, for some reason, Christmas cards. Obviously, missed some people this year! 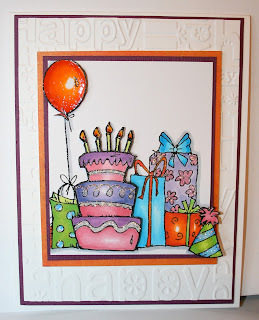 Anyways, I used a Whipper Snapper Design image that I cut and popped up the balloon, the cake and the party hat. Then a bit of glossy accents on the balloon, the flames and then stickles on bits of the images here and there. I decided to mount the image on color but then emboss a large expanse of white to really highlight the image. I am super pleased with how this came out and am thinking I will do several more! It is a smallish image thus making it easy to color quick. Another plus with it being small is that it is also a way to get rid of scraps for the mount layers! Love to clean out the scrap pile! Love your coloring on this lovely image Sheila! Love how you capture the light on your designs! Wow Sheila... another colorful and festive design!! 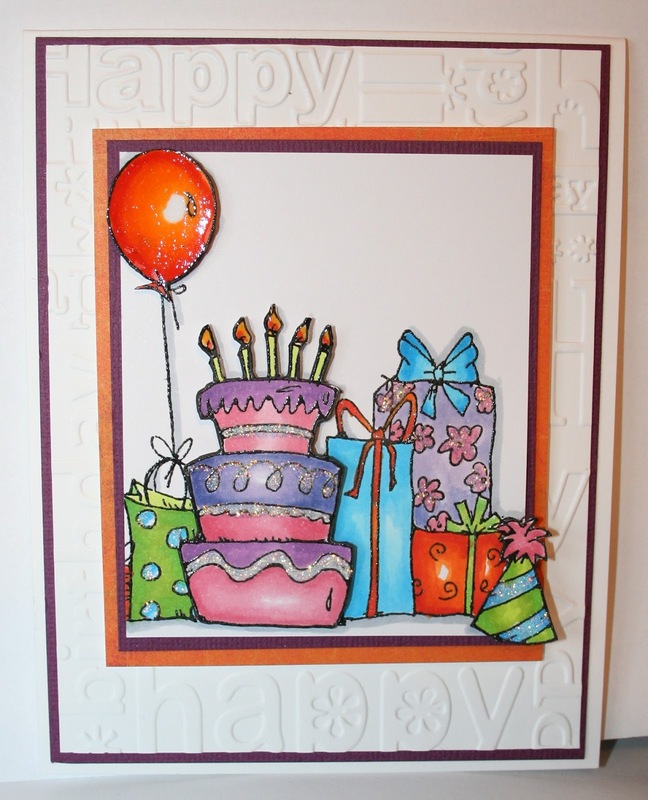 Your birthday stash is growing with creativity! This is seriously party stuff, Sheila! Your coloring is beyond stunning - love how you use white for depth! And the sparkle is perfect. I have finally taken action and bought some WS stamps thanks to your inspiration. Can't wait to ink them up! Hugs. Sheila your cards are gorgeous I am your newest follower. Sheila, this is such a sweet birthday card! So colorful and cheerful! And thanks for the award... am thinking hard as to who to forward this onto as you would have been one of my 5.